Due to popular demand, Allgen The Intelligent Review will once again open its doors to all nurses and/or parents who are interested. 1. The NCLEX Application Process, how do I go about it? 2. The Visascreen Application Process. 3. The role of NCLEX and IELTS in the ICHP/CGFNS Visascreen Application Process. This 3-hour informative activity includes snacks & drinks and is absolutely FREE of charge. If you’re interested, please Call us at (02) 567-2749, (02) 567-0641 or 0918-4688222 or email us at allgenreview@gmail.com. Hurry, the ALLGEN Open-House offers limited slots, so call us now for reservations. Souvenir shot of the speakers and the participants. Nurses listening intensely to speakers. Nurse participants enjoying the cozy athmosphere of Allgen's classrooms. This post is created with the assumption that you have met all of the board of nursing’s eligibility requirements to take the NCLEX Examination. If you’ve already processed your application with NEAC, you can disregard this information as they will do everything for you. 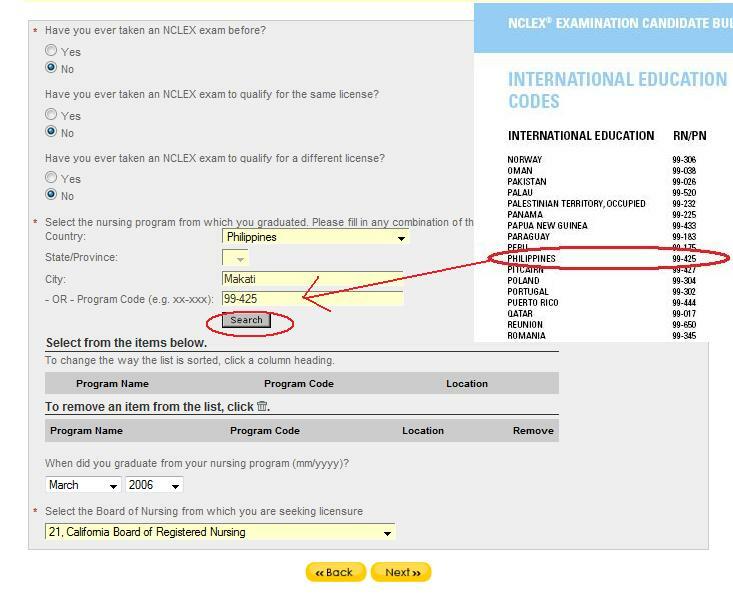 Step 9: Select NCLEX-RN Examination. The application fee is $200.00 (Be careful when you make the selection because any later request to change the examination type will charge you $50). Step 13 Confirmation. In this last step, you will need to confirm your registration. Your name and application number with the amount you need to pay will be provided. Read and tick the confidentiality agreement and then click the “Confirm Registration” Button. If your credit card went through you will then be redirected to a confirmation page. A confirmation will also be sent to your email as well as your log-in information. When you’re ready to take the NCLEX, simply log in to your Pearson Vue Account and schedule your NCLEX-RN. Good Luck! The NCLEX-RN is an examination that helps predict your future as a nurse. Allgen’s innovative approach in delivering effective NCLEX and IELTS Review gives nurses and other professionals the confidence to trust us as a review center. We use an intelligent process to identify and prioritize a candidate’s needs, and then we deliver winning test taking strategies to help them pass the NCLEX and IELTS examinations. For more information about our company please visit our website at http://allgen.net…. Run for a Cause: We too shall run! Get an iPod Shuffle for FREE!